Minister Tony Muhammad was savagely beaten by the LAPD. We are going to the Parker Center to speak to the new police commissioners. 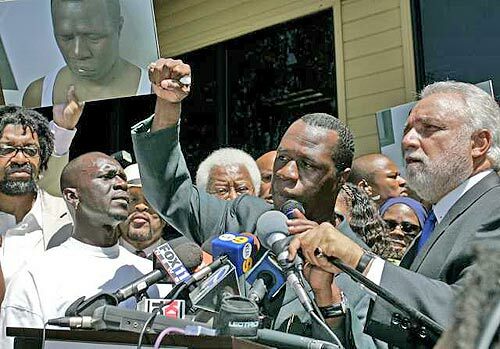 Appearing battered with a swollen face, the western regional director of the Nation of Islam, Tony Muhammad stood Friday with community activists, who accused Los Angeles police of beating the leader without provocation during a street vigil for a Hyde Park slaying victim Thursday night. The incident prompted a day of press conferences and demonstrations, with Mayor Antonio Villaraigosa speaking on live television promising a full investigation and urging the community to stay united. "The attack was unprovoked. He was wrestled to the ground, pepper-sprayed in his face, and once he was on the ground he was kicked brutally and punched in the mouth," said Bakewell, a longtime activist and founder of the Brotherhood Crusade. The Community Call to Action and Accountability will again stage a protest at the new police LAPD commissioner's office. When: Tuesday, August 30, 2005 at 9:00 a.m. Please come out to show your support for Minister Tony. We are also still trying to have the officer who killed 13 year-old Devin Brown fired!